You might have heard of the place known as The Land of Thousand Pagodas. This place is actually called Bagan and it got its nickname because it has over 4000 ancient pagodas! That is not an exaggeration! There are really a lot of pagodas and temples in the area. Of ever you are in the area, here are the places you can visit. You can start with the Bagan Archaeological Museum. If you want to know about the history of the place, then this is definitely the place you should visit when you travel in Myanmar. There are hundreds of artifacts that describe how Bagan evolved from what it was before to what it is now. The entrance fee is inexpensive and you will get your money’s worth! 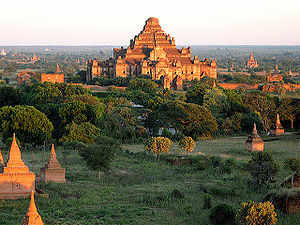 Another place that is a must visit is the Bagan Viewing Tower. An elevator will bring you all the way up. The best time to go is during the sunset because it is just beautiful. You will be able to see until the Ayerawaddy river! It is a very captivating view. Most people wonder how they can go around the area. Well, there are many fun ways to do that. The cheapest is through a bicycle. It is great way to get some exercise as well. You can reach most pagodas and temples with a bicycle. Ask your hotel where you can rent one. Another fun way to travel around Bagan is by a horse cart. In fact, this is the most popular way of travel. The cost is somewhere between 10,000 – 20,000 kyats. These horse cart drivers speak basic English and can act like a tour guide as well. They are very nice people. Tuk Tuks are converted pick-ups. Though they travel only along the main road, they are very inexpensive and will be worth your money. Just about 300 – 500 kyats per ride per person. Last but not the least, you can take the conventional taxi. Payment depends on how far you will travel. If you will be travelling to Bagan, it is best you seek the assistance of a travel agency so you can easily book hotels and places to visit! Traveling to Myanmar is surely something desired by many travellers now as the country has opened up in the past 2 years.